Experiencing significant changes in her health using alternative treatments is what committed Carissa Doherty to becoming a Naturopath. Carissa completed her premedical studies in 1998 at the University of Guelph obtaining a Specialized Honours degree in Bio-Medical Toxicology. During her undergraduate years, Carissa was fortunate enough to be one of the first people in Canada to work in product development with inulin, a complex carbohydrate, now used widely in the supplement industry as a pleasant tasting fibre. 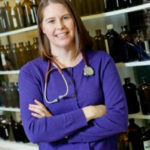 Dr. Carissa is one of few Naturopathic Doctors with an undergraduate degree in Biomedical Toxicology and additional specialized training in Environmental Medicine. In 2002, Carissa received her Doctorate in Naturopathic Medicine at the Canadian College of Naturopathic Medicine. While a student at CCMN, Carissa was selected to be a naturopathic intern at the Anne Johnson Health Station, a naturopathic outreach clinic where Gerontology, MS and Spinal Injuries were a focus. During her training, Carissa was selected to attend the Ontario Medical Student Conference as a Naturopathic Representative. Carissa and her sister Sonya Doherty, N.D. opened The Natural Care Clinic in Burlington in 2005. Their approach in treating chronic illness has become world renowned drawing patients to the Natural Care Clinic from all over the world. In addition to a general family practice, Carissa takes a special interest in biomedical treatment of autism, Lyme disease, hormone health, fertility and prevention of developmental delays, methylation medicine and environmental medicine.